Earlier this week, Tyler, the Creator tweeted that he had been banned from Australia due to the efforts of an activist group that believed the rapper encouraged negative attitudes towards women. The Australian government later issued a statement suggesting that a decision had not yet been made about Tyler’s visa. However, after the MC called out one of the activists and accused her of denying him access to the country, she received a number of threats from the rapper’s fans on social media. But last night, Tyler was in kid-friendly mode: he donned Dr. Seuss-appropriate attire and rapped segments of the writer’s latest (posthumous) release, What Pet Should I Get? The MC then performed a couple of songs from his last album, Cherry Bomb. 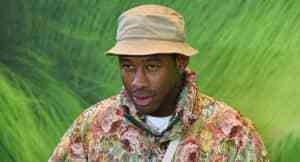 Watch below, and read Tyler’s FADER cover story.